Anne Dallas Dudley. Photo courtesy of the Library of Congress. 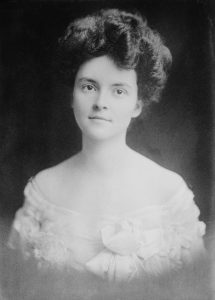 A national and state leader in the women’s suffrage movement, Anne Dallas was the daughter of a prominent Nashville family. She attended Ward Seminary High School and Price’s College in Nashville before marrying Guilford Dudley, who founded an insurance company in Nashville. The couple raised their family at a country estate in West Nashville. In 1911, Anne joined the local suffrage group and four years later was named president of the Tennessee Equal Suffrage Association. Two years later, in 1917, she was elected third vice president of the National American Woman Suffrage Association (NAWSA). Although her social circles did not support votes for women, she was devoted to the cause and campaigned and organized throughout Tennessee. In her role as an officer of NAWSA, she organized suffrage leagues and spoke throughout the United States. Anne involved both of her children in suffrage parades and circulated a photo of the three of them to demonstrate the respectability of supporting women’s suffrage. Under her NAWSA leadership, the embrace of suffrage grew and the number of supporters increased. Abby Milton of Chattanooga and Catherine Kenny of Nashville worked closely with Anne in organizing and coordinating the all-important Tennessee suffrage movement. 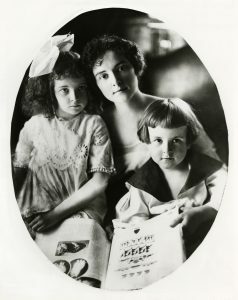 Anne Dallas Dudley with her children. Photo courtesy of the Tennessee State Library and Archives. In August of 1920, with just one state remaining to ratify the 19th Amendment, Anne led the challenging but successful final ratification effort. NAWSA representatives, led by President Carrie Chapman Catt, established headquarters for the campaign in a Nashville hotel. The National Woman’s Party (NWP), led by Tennessee native Sue Shelton White, set up headquarters for their campaign at another hotel. But the ranks of anti-suffragists—and their lobbying efforts—were equally strong. Under pressure from the National Democratic Party, the Democratic governor called a special session of the legislature, where lawmakers’ positions were debated zealously and support tallies had to be taken continually as positions changed. Ratification finally was won by one vote, that of 24-year-old legislator Harry T. Burn, who was urged by his mother in a letter, “Don’t forget to be a good boy and help Mrs. ‘Thomas’ Catt with her ‘rats’…Ha!” Burn cast the deciding vote, and despite legal wrangling, including an injunction against reporting the result to Washington, Tennessee reaffirmed its vote and became the “Perfect 36,” the 36th and final state needed for ratification of the 19th Amendment. In 1920, Anne attended and made a seconding speech at the Democratic National Convention in San Francisco as the first woman delegate-at-large. She stayed active in politics through the fall of 1920 as a volunteer to Governor Albert H. Roberts in his unsuccessful reelection bid. She helped organize the Woman’s Civic League of Nashville and was president of the Maternal Welfare Organization of Tennessee, which brought birth control pioneer Margaret Sanger to Nashville in 1938. Anne Dallas Dudley’s image appears in the Tennessee state bicentennial oil painting, The Pride of Tennessee, which hangs in the Capitol. She was inducted into the National Women’s Hall of Fame in 1995. Carol Lynn Yellin and Janann Sherman, The Perfect 36, Tennessee Delivers Woman Suffrage, (Memphis, TN: Vote 70 Inc., 1998).